The JBoss Rules Framework, more often referred to as "Drools", is an excellent tool for combining Rules, Workflow, and Events into what the framework authors call "the Business Logic Integration Platform" (BLIP) . We use Drools extensively on our project; the framework enabled us to quickly construct a rich Event Driven Architecture (SOA 2.0) in a very short time frame. In fact, we like Drools so much, we've been considering using it in the realm of NLP as a way for applying rules to Entity Extraction and Resolution (I should mention this was originally John's idea). The downside to Drools is that the framework is written in Java. Sure, Mark Proctor and gang have put a lot effort in making the platform accessible to other languages through web services, but this is far from the level of integration I would enjoy (like a C# version). I think I should take the time an caveat the fact that I consider myself to be a Java programmer (first and foremost) and then a C# developer, but after a couple of solid weeks in .NET, I find it difficult to go back. The one thing I do love about Java (more than anything else) is the language's amazing Open Source community. So instead of embracing the "Dark Side" and becoming a Microsoft evangelist, I have decided to look into the newer languages written for the JVM. The two JVM languages I find the most intriguing are Clojure and Scala. We have joined many other open source projects (such as Hibernate, Seam, Infinispan, ...) and migrated Drools from Subversion to Git. Subversion has served us really well, but the features such as pull requests, cherry picking, cheap branching and multitasking in isolation, which git brings to the table, are just to nice not to have at our disposal. So go ahead, fork it and send us pull requests! There is a bit of a learning curve though. The step from Subversion to Git is bigger than the step from CVS to Subversion was. Below is a short guide for SVN guys that don't know Git yet. This document shows you how to use Git, just as you were using SVN in the past. It is to get you guys up and running with git as soon as possible by relying on your SVN knowledge and it is focuses on what you want to do in drools. This document does not really teach you Git. Git is not just SVN++, it is much more and you should take some time to learn that too. SVN trunk is renamed to Git master. A branch is still a branch. A tag is still a tag. The SVN central repository is now the reference repository on github, see https://github.com/droolsjbpm/droolsjbpm. 2b) Eclipse: Install the EGit plugin. Menu Help, menu item Install new software. Work with update site Helios, open Tree item Collaboration, tree item Eclipse EGit. Menu file, menu item Other Settings, menu item Configure plugins. $ git config --global user.name "My Full Name"
So what’s the command git checkout for? To switch to another branch, but in the same working directory. In SVN you also use svn checkout for that. Follow the instructions in the README.txt to set up your Eclipse or IntelliJ again. So Mark and Edson changed something in drools-core in the reference repository. How do I get those changes? In SVN this is svn update, but in Git this is a git pull. Be aware, if you have local uncommitted changes, you 'll want to apply those changes after any changing coming from master, so it's better to add the --rebase argument. If there's any output, read it: there might be merge conflicts. While making your changes, do the same as in SVN: git add, git rm (instead of svn delete), git status. After making your changes, you ‘ll want to do a git commit (when you’re done with a changeset) and a git push (to share those changes with the rest of the team). To recap: doing a git commit does not push your changes to the remote repository yet, you also need to do a git push. Important rule: Do not rebase commits that you have pushed to a public repository. In this use case, this probably isn’t a problem (if you still use the same remote repository). What is origin? Because git can work with multiple remote repositories (usually forks of the same project), the default remote repository is known as origin. If you’ve cloned the reference repository, then origin is the reference repository. If you’ve forked the reference repository as A and cloned A, then origin is A. Usually we’ll have 2 types of branches: release branches and topic branches. A release branches is copied from the master branch and only receives bug-fixes. It is separated from the master branch so no unstable features or improvements (pushed by other developers) leak in. Cherry picking is very interesting to pick bug-fixes from the master branch into the release branch. A topic branch is copied from the master branch and is eventually merged back into the master branch. Its changes are to disruptive to other team members to be committed to the master immediately. Do you want to really learn Git? You’ll easily gain the time you spend reading that book, because Git is more than SVN++. Read that book, especially if you’re going to do branching and merging! We're glad to announce jBPM-5.0-CR1. This release candidate includes many small improvement on the core process engine, the web-based monitoring and management console and the human task integration. Want to give it a try, but don't know where to start? Download the installer and follow this chapter that will guide you through the different components using a simple example. If all goes well, we'll be doing a final release in a few weeks. So give this one a try and let us know if you still discover some issues, so we can do the final fixes. If you are in the SF Bay Area, Intalio would like to invite you to a meetup on Thursday January 13th at Intalio HQ. We want to build a Drools community in the bay, and we would like to introduce what Intalio is doing with Drools there. We're interested into getting to know the Drools users some more as well. We're next to Gordon Biersch, up the stairs. For those who missed the JBoss Developer Webinar on jBPM5 last Wednesday, a recorded version is now available. It gives a short intro on BPM and gives an overview of the new features of jBPM5. If you're only interested in the slides, you can see (and download) them here. There were a lot more questions than we actually could handle in the Q&A part of the presentation, so I'll try to compile a list of additional answers and publish them on this blog next week. The webinar from the 16th of November, mentioned previously here, is now available online here. As part of the bi-weekly JBoss Developer Webinar Series, I will be giving a presentation on jBPM5 next week Wednesday, November 17, 12:00 PM EST / 17:00 GMT. This presentation will be suited both for people that are not really familiar with jBPM but would like to get an introduction what it is all about as well as for people that have experience with previous versions of the project and would like to know what's new. With the possibility to ask your questions afterwards of course. 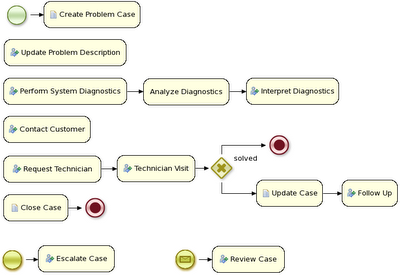 I will also touch on how jBPM5 is tackling exciting hot topics like case management, event-driven BPM, etc. So don't miss out and register now! A while ago we proposed "Left and Right Unlinking - Community Project Proposal"
Since then Leonardo Gomes has taken on this challenge, after successfully completing the Lazy Truth Maintenance System enhancement. James Taylor, author of Smart Enough Systems, is organising a Drools webinar. I've provided the link below and a copy of the text. Claye Greene and Kristy Sanders of Technology Blue are giving a webinar on Best practices for using JBoss Drools on November 16th, 2010 at 10am Pacific. Open source has proven to be a valuable solution for companies looking to lower implementation costs of software solutions. A few years ago open source Decision Management solutions were considered a risky proposition at best. However as a technology solution for managing and executing decisions, open source solutions like JBoss Drools have quickly become a viable, enterprise-class alternative. This webinar discusses the pros and cons of using an open source Decision Management solution while leveraging meaningful code samples to illustrate lessons learned and best practices with JBoss Drools. If you are currently implementing, or planning to implement an open source solution for managing enterprise decisions, this webinar will provide insight and approaches to maximize success. Case management was one of the recurring themes last week at the Business Process Forum. There definitely seems to be a growing need amongst end users for more flexible and adaptive business processes, without ending up with overly complex solutions. Everyone seems to agree that using a process-centric approach only in many cases leads to complex solutions that are hard to maintain. The "knowledge workers" no longer want to be locked into rigid processes but wants to have the power and flexibility to regain more control over the process themselves. The term case management is often used in that context. I'm not going to try and give a precise definition of what it might or might not mean [1,2], but it refers to the basic idea that many applications in the real world cannot really be described completely from start to finish (including all possible paths, deviations, exceptions, etc.). Case management takes a different approach: instead of trying to model what should happen from start to finish, let's give the end user the flexibility to decide what should happen at runtime. In its most extreme form for example, case management doesn't even require any process definition at all. 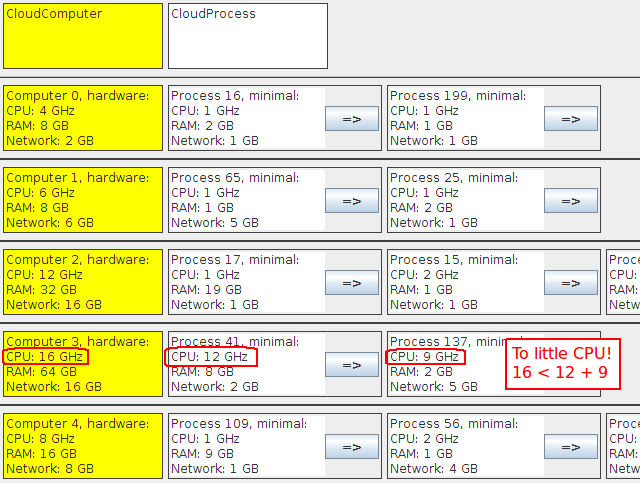 Whenever a new case comes in, the end user can decide what to do next based on all the case data. A typical example can be found in healthcare (clinical decision support to be more precise), where care plans can be used to describe how patients should be treated in specific circumstances, but people like general practitioners still need to have the flexibility to add additional steps and deviate from the proposed plan, as each case is unique. And there are similar examples in claim management, helpdesk support, etc. So, should we just throw away our BPM system then? I don't think so! Even at its most extreme form (where we don't model any process up front), you still need a lot of the other features a BPM system (usually) provides: there still is a clear need for audit logs, monitoring, coordinating various services, human interaction (e.g. using task forms), analysis, etc. And, more importantly, many cases are somewhere in between, or might even evolve from case management to more structured business process over time (when we for example try to extract common approaches from many cases). If we can offer flexibility as part of our processes, can't we let the users decide how and where they would like to apply it? Let me give you two examples that show how you can add more and more flexibility to your processes. 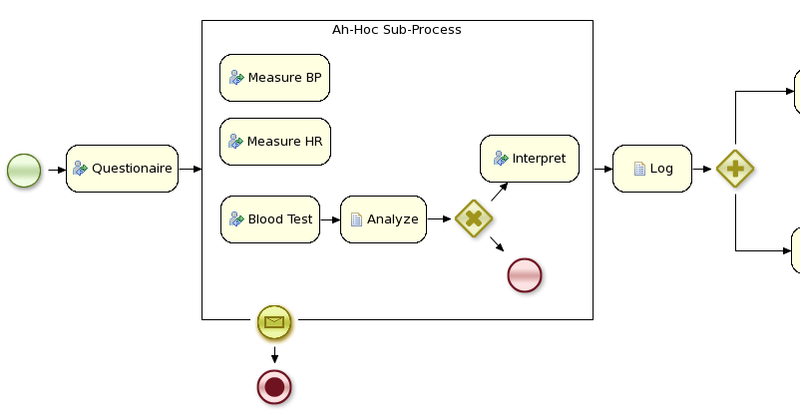 The first example shows a care plan that shows the tasks that should be performed when a patient has high blood pressure. While a large part of the process is still well-structured, the general practitioner can decide himself which tasks should be performed as part of the sub-process. And he also has the ability to add new tasks during that period, tasks that were not defined as part of the process, or repeat tasks multiple times, etc. The process uses an ad-hoc sub-process to model this kind of flexibility, possibly augmented with rules or event processing to help in deciding which fragments to execute. The second example actually goes a lot further than that. In this example, an internet provider could define how cases about internet connectivity problems will be handled by the internet provider. 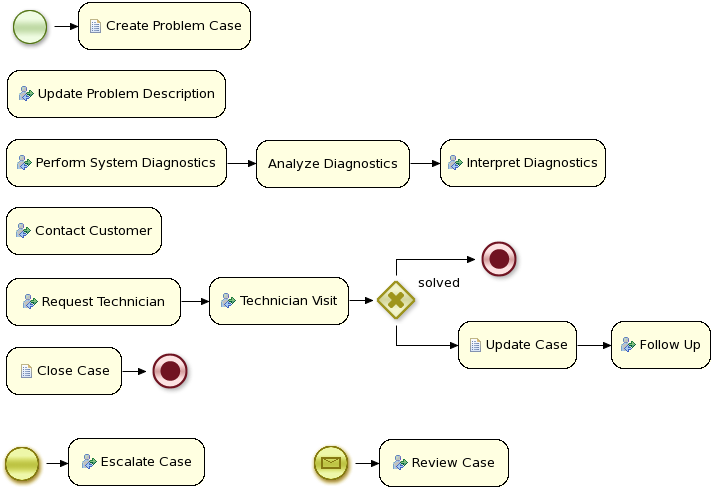 There are a number of actions the case worker can select from, but those are simply small process fragments. The case worker is responsible for selecting what to do next and can even add new tasks dynamically. As you can see, there is not process from start to finish anymore, but the user is responsible for selecting which process fragments to execute. And in its most extreme form, we even allow you to create case instances without a process definition, where what needs to be performed is selected purely at runtime. This however doesn't mean you can't figure out anymore what 's actually happening. 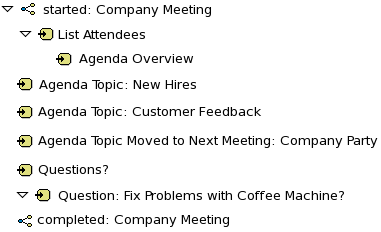 For example, meetings can be very adhoc and dynamic, but we usually want a log of what was actually discussed. The following screenshot shows how our regular audit view can still be used in this case, and the end user could then for example get a lot more info about what actually happened by looking at the data associated with each of those steps. 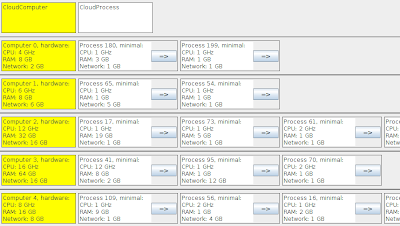 And maybe, over time, we can even automate part of that by using a semi-structured process. We hope that already goes a long way in supporting your cases! Markus has released his first article on his rules and workflow integration using drools expert and flow, which he's posted to TSS for discussion. "Interested in learning how business rules and workflow paradigms can be meaningfully combined to model flexible business logic as well as to technically bring the conceptual model to execution using jBoss Drools? This tutorial is split up into multiple parts. In the first part, an exemplary realistic service request process is presented. In the subsequent parts, the focus is shifted on the different Drools technical details and give you step-by-step instructions on how you have to can realize the particular flexibility mechanisms. Have a look at the tutorial http://www.markus-doehring.de/phd/index.php?option=com_content&view=article&id=46:servicerequest1&catid=34:droolshowtocategory&Itemid=53"
Everybody is talking about the cloud these days, but it too suffers from planning problems. So I created a new example this weekend for Drools Planner to deal with those planning problems: CloudBalance (available on trunk). The problem is simple: there are a number of computers and a number of processes, which we want to run on the computers. Every computer should be able to handle the sum of the minimal hardware requirements of all its processes. 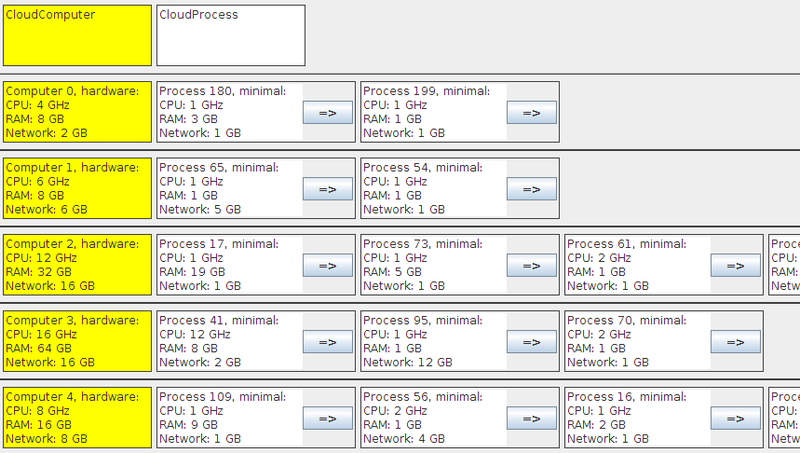 As you can see, some processes don't meet their minimal CPU requirements. 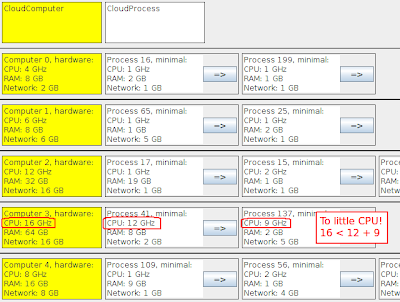 All processes meet their minimal hardware requirements. And if we give it more time, it will try to shut down computers and save power costs, while still meeting the minimal hardware requirements of all processes. 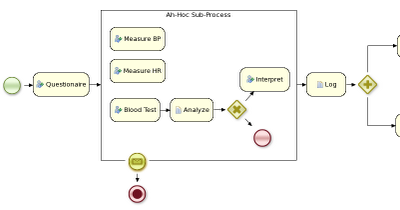 "The primary goal of BPMN is to provide a notation that is readily understandable by all business users, from the business analysts that create the initial drafts of the processes, to the technical developers responsible for implementing the technology that will perform those processes, and finally, to the business people who will manage and monitor those processes." 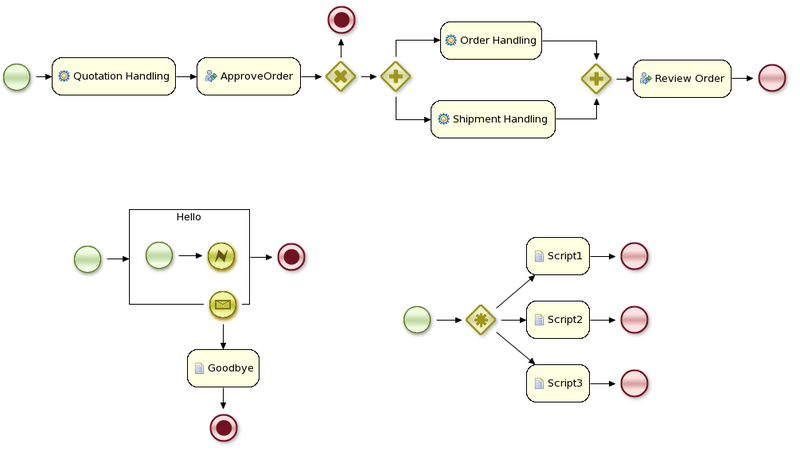 The second version of the Business Process Model and Notation specification (BPMN 2.0) by OMG not only defines a standard on how to graphically represent a business process (like BPMN 1.x), but now also includes execution semantics for the elements defined, and an XML format on how to store (and share) process definitions. The BPMN2 specification contains an explanation of how to represent executable business processes, both visually and syntactically, by combining a large set of different node types (and related elements). jBPM5 supports most of the "Common Executable" subset of the BPMN2 specification (containing the most common node types and attributes for specifying executable business processes) and already a few more node types. The documentation gives a detailed overview of which elements an attributes exactly. To get started, the BPMN2 specification obviously serves as the reference, but additional to that, the jbpm-bpmn2 module contains a lot of junit tests for each of the currently supported node types. These test processes can also serve as simple examples: they don't really represent an entire real life business processes but can definitely be used to show how specific features can be used. For example, the following figures shows the flow chart of a few of those examples. The entire list can be found here. Want to know more details, check out the BPMN2 chapter in the jBPM5 documentation. Myself, Edson and Davide are here. Davide did a great lunch time talk. Kris will be arriving on Wednesday to help with the BootCamp. It's been a lot of preparation last week and we'll be very busy this week and next, so apologies if our responses aren't timely on mailing lists and irc. Here we go ... first jBPM5 snapshots ! We've been talking about it for a while now, and working on it even longer, but we believe the time has come to just get the jBPM5 code out there and start asking for community feedback and assistance. Documentation (which is still under heavy construction but will be extended significantly in the next few weeks) can be found here. We are looking into an end of February date to do the next week long Boot Camp, location to be decided - proposals for USA so far are Chicago, Austin and Miami. The EMEA one will be Berlin, probably overlapping with the 2011 JudCon. The last boot camp had a medical focus and was a huge success. We have more budget this year so hoping to build on that. We are thinking of doing a Monday optional 1 day pre-conference "basics" day, to avoid repeating the "what is a process, what is a rule, what is an event" type talks. This also means we don't bore returning people with repeated content and that everyone there has the basics. Then follow up with 2 days of applied industry talks split into "vertical tracks". Because of the high level of interest and success last time, we will run a dedicated 2 day Medical/Healthcare track again. Whether we run dedicated or mixed tracks for other verticals depends on interest and people's willingness to present or organise and lead other verticals. I imagine initially we'd probably do mini tracks, say half a day per vertical. Some target verticals would be telecoms, commercial finance (trading), consumer finance (mortgage/insurance/loans), logistics. The 4th day would then be an organised workshop day. We'll provide bootable USB keys for all in attendance, so that we have a quick start off (previously we wasted hours getting everyone up and running with virtual images). The workshops will allow people to go through the very basic examples or the more advanced examples and infrastructure set-up with us on hand. Those that have their own projects and just want to work on that with us on hand to offer help can do so too. The 5th day will be more of an open floor. Some people will leave early, others will want to continue working through the basic examples and making sure they can configure and set everything up. Others will want dedicated discussion time to work on their own problems and ideas. In general it's the day where the developers will be on hand for what ever anyone wants – you'll get out of it what you put in. If you would like to present or even run and organise a vertical let me know. In the past I've found for a vertical to work it needs a well connected industry person to chair it, so we definitely need community people to take up the mantle here. Talks can either be "What we did with Drools and/or jBPM" or "This is an industry problem use case that could be solved with Drools and/or jBPM" or just something that we think will be of interest to the audience. The range of technologies covers (but not limited too) rules (expert systems and other derivatives domains), workflow, event processing and ontologies. The event will again be free for attendance. We are thinking of opening it up for sponsorship to help towards food and drink. So if you are interested in talking, organising, sponsoring or just have some general input then let us know - we want to progress in moving these events to a more industry focus and not pure technology, for that to happen we need YOU the community. Do you use Drools, a very popular rule engine? Do you use IntelliJ IDEA? Then this post might be interesting for you! Peter Gromov showed me the power of custom file types. Another secret I discovered in the world’s greatest Java IDE. I followed his advice and created a custom file type for DRL files. You can easily import this IDEA drl file type with File > Import Settings... I didn’t tried to import them, so back up your settings please. You want more? Go and vote for IDEA-24348. Here are the slides I presented at the it@cork Conference. In the meantime I tried to think of a simpler enhancement that we would like to see done. At the moment Drools has a user setting "MaintainTMSOption" which can be true or false. It's a small optimisation that when turned off avoids using the equality hashmap that is maintained for all inserted objects. It would be a much better idea to remove this configuration setting, thus simplifying things for end users and have TMS lazily enabled on demand. For each object type there is an "ObjectTypeConf" configuration object that is retrieved every time a working memory action, such as insert, is executed. The enabledTMS boolean should be moved there, so there is one per object type, by default it is false. When a working memory action occurs, like insert, it retrieved the ObjectTypeConf and checks the maintainTms boolean there, instead of the current engine scoped configuration. When a logical insertion occurs and the ObjectTypeConf is retrieved if maintainTms is false it sets the value to true and then iterates the associated ObjectTypeNode memory lazily adding all the objects to the TMS equality map. From then on for that ObjectType all inserted objects are added to that equality map. With this you now have the advantage of TMS being laziy enabled, so the minor hashmap operation is no longer used and likewise a small memory saving from not populating the map. There is a further advantage that this is now fine grained and when enabled only impacts for that specific object type. A further enhancement could use a int counter, instead of a boolean. Each logical insertion for that object type increases the counter, each retraction decreases the counter; even if automatically retracted if the truth is broken for that logical assertion. When the counter reaches zero, TMS for that OTN can be disabled. We do not however remove the objects from the equality map, as this would cause "churn" if TMS is continuously enabled and disabled. Instead when TMS is disabled record the current fact counter id. Then if TMS is disabled on a retraction but there is a counter id, we can check that counter id to see if the fact is prior to TMS being disabled and thus would need to be retracted from the equality map. Mical Bali has written an article on CEP, so thought i'd link it in. In this article, by Michal Bali, author of Drools JBoss Rules 5.0, we'll look at implementing a banking fraud detection system. It is an ideal candidate for CEP. The volume of events in a banking system is huge and we need to be able to do complex decisions based on these events. After the first success at Boston, JUDCon, the conference for and by JBoss users and developers, is coming to Berlin on October 7-8. This time, there is a special track on Workflow and BPM on day 1. So hopefully there will be a lot of interesting presentations on Drools Flow / jBPM. The call for papers is still open (until September 13), so hurry is you want to submit a session. So if you are or want to become part of the community, don't hesitate! I'll be giving a presentation on jBPM5 and will be available if you want to talk or even dive into code. Ideal chance to talk to core or other community developers. I'm just having a little bit of fun, at their expense, which is well deserved for such shockingly bad behaviour. So I would urge anyone else to join in and have some fun too :) Do your own blogs, polls etc to bring attention to this. Being slightly less tongue in check, this is just the reality of open source, I've been doing this a long time now and I know you just have to live with it, take the lumps with the smooth - as long as you get more smooth than lumps, it's still worth while :) At it's best it brings people together who collaborate and help each other and enrich the open-source eco system. At it's worst you have organisations such as Progress executing on predatory amoral tactics. The debate on whether all corporations are ultimately operating on degrees of amorality is out of scope for today :) As each year goes buy you start to appreciate Red Hat more for the sterling work it does in open source. While it would be nice if Progress got involved and contributed to Drools, the reality is that this doesn't bother me as much as you think it would, and I'm not throwing my toys out the pram. It hasn't lestened the Drools community and technology, we still go from strength to strength, and I've always been more concerned about what we are doing and achieving than what someone else may or may not be doing with regards to taking advantage of our work. PS. Progress, shame on you. So earlier this year someone packaged up the open source Drools BRMS and added one of the more uninspiring industry BPM products and sold it to Progress for $49 million, who are calling it Savvion BRMS, otherwise known as "A Bridge in Brooklyn". Progress already have a failing strategy with Open Source, pumping millions into acquiring open source projects and communities only to then have no idea what to do with them and then dump them almost as rapidly. The ripping off of Drools and selling it as their own, only shows even deeper levels of desparations and incompetence, with no ability to innovate on their own. Progress has never contributed a single line of code to Drools, they are not involved in the community process or have any real insight or involvement of the road map and future developments. Shame on you Progress you represent some of the worst predatory practices in the open source industry. Not only have you ripped off the hard work of many people, some dedicating their lives to making Drools a success. You then shamelessly pass it off as your own misleading your paying customers who have no idea that you are flogging them an out dated version of a freely available open source project, that you can't even really offer proper support for. I don't think Progress really thought this through, or under stood what Drools is or where it is going, as it complicates their portfolio and they'll have no ability to bring in the latest Drools innovations while keeping their portfolio sane. Or maybe that's the plan, they realise their own tech stack is pants and looking for Drools to provide their future BPMN2 and CEP solutions, and are just slowly phasing it in so not to alarm customers who are investing in their soon to be deprecated products. Progress has a CEP product and Drools Fusion does CEP. 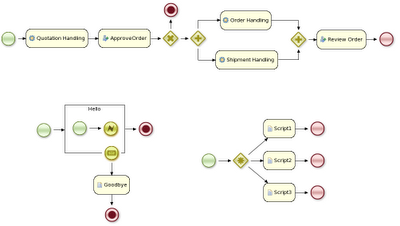 Savvion provides BPM software, yet Drools now does BPMN2. These things are tightly integrated with Drools, if they attempt to remove them or hide them, they are then just selling the customers crippleware. Why would someone buy that, when they can get the real deal from Red Hat, who can actually provide support they can stand behind. This is only going to get worse for them, as we are investing further in these technologies providing even greater value via deeper integration, all of which will be leveraged for our grid solution in delivering Drools in the cloud. Any customers using Savvion BRMS are going to feel like someone has delivered them a Porsche, but when they take it for a spin they find out it's got the engine of a three wheeled Robin Reliant in it. 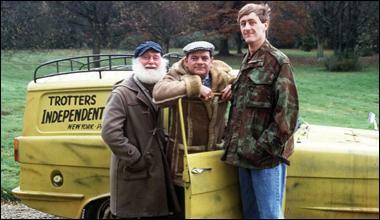 Well done Progress, you'd make Del Boy Trotter proud. You Plonkers!. To organisations that are still tempted by Savvion BRMS, why not invite me along to the sales call. I'll be more than happy to interview their support team and engineers with a few choice questions to see if they can actually support what they are selling you.